Update: The PS4 pic is from last year and not Gamescom 14. Leaving the Op-ed as it is though. [Op-ed] You know, I find Microsoft’s antics pretty interesting. They go through all that trouble to rig up Xbox One showcases even after the high number of times they have been caught using PCs behind the curtains. False advertisement aside, won’t it be better just to openly admit that these are Target Renders running for the purpose of showing off only? Hmm, maybe not. Interestingly though, a thread at r/PCMasterRace reveals that Sony might be guilty of the exact same thing. Microsoft Caught Using Nvidia-Powered PC Builds at Gamescom – Who would’ve guessed? The first thought that came to my mind when I happened across this news at multiple other sites was “Oh no, not again…”. And no, I was not quoting Agrajag from Hitch Hiker’s Guide to the Galaxy but rather expressing my exasperation on Microsoft’s antics. However, I found something very interesting in my reddit feeds as well. The subreddit r/PCMasterRace has posted very suspicious pictures of what looks like Sony attempting the same ploy. Frankly speaking, after this, I doubt I am ever going to trust a console demo completely, no matter how much it looks like the real deal. And I have a feeling, that I wont be alone with these trust issues. Microsoft has garnered a lot of bad PR in the past in their use of PCs to demo games with amazing graphical prowess and then later releasing a cut down and downgraded version to retail. But if Sony is doing the same here, and that’s a big if, logic dictates that this might not be the first time they have done something like this. You have probably seen the Xbox one pictures so take a look at the PS4 picture. 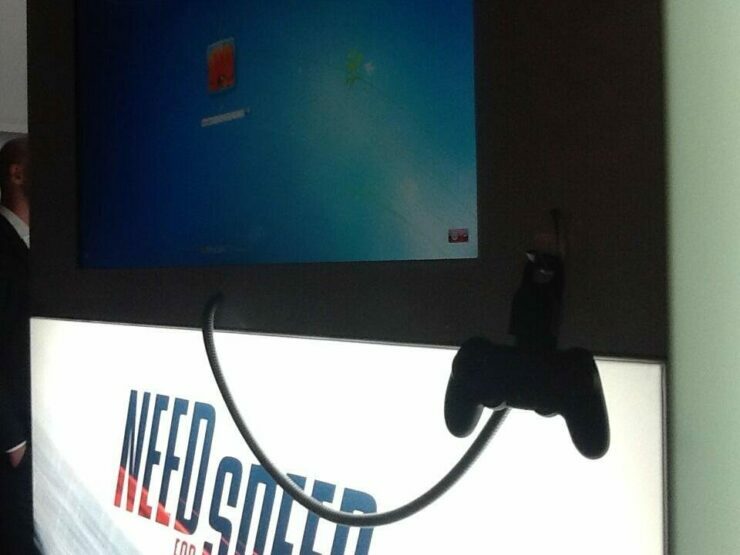 We see the windows login screen at what appears to be a PS4 booth demoing Need for Speed rivals. Now to be fair, the controller is too dark and we can’t be sure whether this was Gamescom or not. 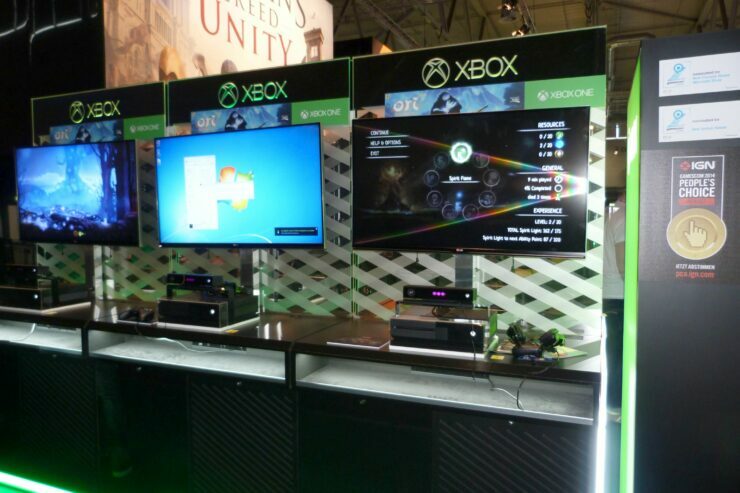 But the fact still remains that this appears to be a PS4 booth actually running windows. Now to be fair, I understand why both giants choose to go with PC Builds. Cutting edge or prototype AAA titles probably run on the periphery of what the Console Hardware can offer, and sometimes more than what the Hardware can withstand. As such, glitches, fps problems and simple crashes have a higher probability of happening in a console then a PC build, seeing the PC can usually compensate by sheer bruteforce. The problem is, that this usually results in a severely false advertised product, that is no where near to the the item that was actually demoed. These kind of tactics are only acceptable, if it is just a matter of time before the same performance and quality can be reproduced on the console. Though this will get me flamed, this is usually not the case when dealing with Xbox One more than the PS4. I don’t know about you guys, but this kind of behavior needs to be discouraged. It shouldn’t matter that the PS4 or the Xbox One dont have the same hi-def textures of the PC equivalent since if the player can never get to play them, they are more than useless. It should be an Industrial norm to run demos of consoles, on consoles. And though this seems pretty much like common sense, this is sadly not the case.